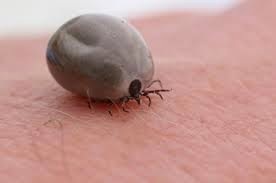 Lyme disease is an infectious disease transmitted by a tick bite. Its symptoms are a rash, fever, headache and fatigue, although not all symptoms may appear. Treatment with antibiotics usually eliminates the symptoms, but delayed treatment can result in more serious problems. “Chronic” Lyme disease (CLD) is regarded as a multi-systemic illness, and may affect every part of the body causing fatigue, stiff neck, headaches, light and sound sensitivity, tinnitus (ringing in the ears), anemia, dizziness, joint and muscle pain, brain fog, tingling, numbness and burning sensations of the extremities, memory and concentration problems, difficulties with sleep (both falling asleep and frequent awakening), chest pain and palpitations and/or psychiatric symptoms like depression and anxiety. A new term, Post-treatment Lyme disease syndrome, has been coined for those who (probably) had Lyme disease but whose symptoms remain, although there is no good evidence that these symptoms can be attributed to a persistent Lyme infection. There is no scientific controversy, however, that “chronic Lyme disease,” as applied to patients with nonspecific symptoms who show no objective evidence that they have been infected with Lyme disease, is a fabricated disease. It is these patients who have been victimized by “Lyme literate” doctors and alternative medicine providers. In the past, Chronic Fatigue Syndrome (CFS) or other terms that tried to encompass similar symptoms such as myalgic encephalomyelitis (ME), post-viral fatigue syndrome (PVFS) or chronic fatigue immune dysfunction syndrome (CFIDS), was rife in western countries. Because Chronic Fatigue Syndrome is now increasingly seen as a psychological problem, some 'patients' have turned to another illusive disease. Enter Post-treatment Lyme Disease Syndrome.